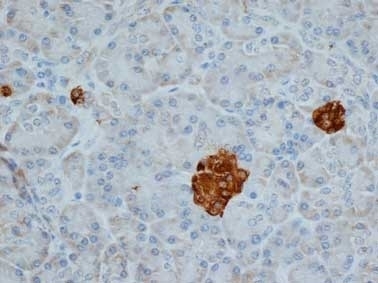 Mouse anti Human Chromogranin A antibody, clone LK2H10 specifically recognizes chromogranin A (CgA), a secretory glycoprotein and member of the chromogranin/secretogranin family, widely expressed by cells of the neuroendocrine system and related tumours, which is used in immunohistochemistry as a valuable diagnostic marker for pheochromocytomas, paragangliomas and carcinoid, pancreatic and prostate tumours. CgA constitutes one of the most abundant components of secretory granules, and is the precursor to several functional peptides, including vasostatin and pancreastatin. Clone LK2H10 has been shown to be suitable for use on cytospins (Jensen et al. 1990). Spleen cells from immunised Balb/c mice were fused with cells of the NS-1 mouse myeloma cell line. Lloyd, R.V. & Wilson, B.S. 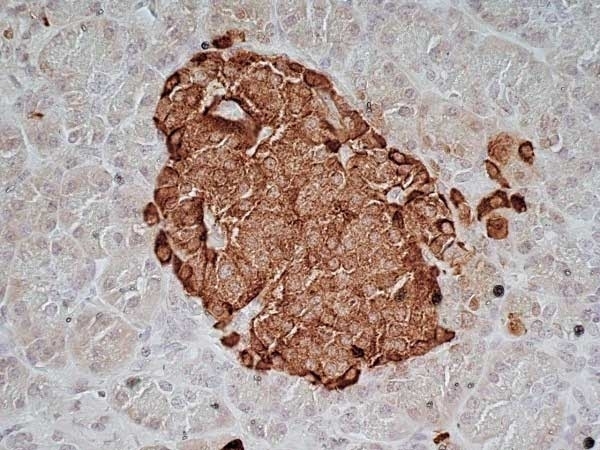 (1983) Specific endocrine tissue marker defined by a monoclonal antibody. DeStephano, D.B. et al. (1984) Pituitary adenomas. 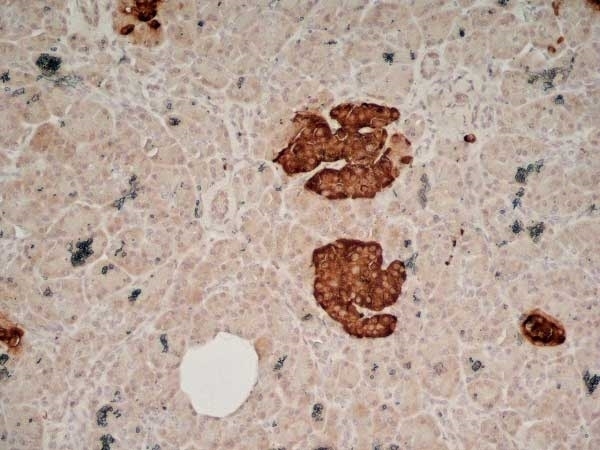 An immunohistochemical study of hormone production and chromogranin localization. Am J Pathol. 116 (3): 464-72. Jensen, S.M. et al. (1990) A comparison of synaptophysin, chromogranin, and L-dopa decarboxylase as markers for neuroendocrine differentiation in lung cancer cell lines. Cancer Res. 50 (18): 6068-74. Lloyd, R.V. et al. 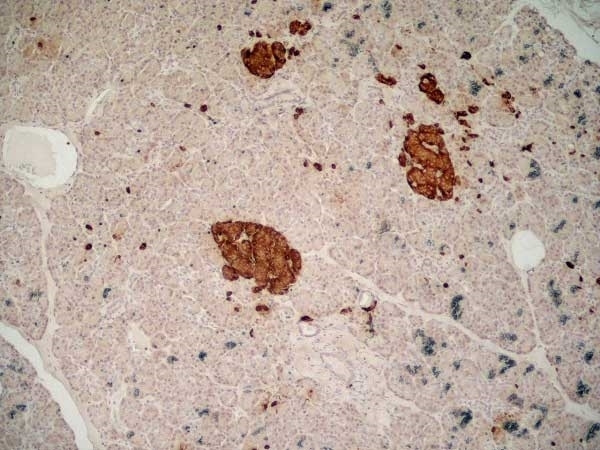 (1984) Immunohistochemical detection of chromogranin and neuron-specific enolase in pancreatic endocrine neoplasms. Am J Surg Pathol. 8 (8): 607-14. Walts, A.E. et al. (1985) Chromogranin as a marker of neuroendocrine cells in cytologic material--an immunocytochemical study. Am J Clin Pathol. 84 (3): 273-7. Wilson, B.S. & Lloyd, R.V. (1984) Detection of chromogranin in neuroendocrine cells with a monoclonal antibody. Am J Pathol. 115 (3): 458-68. Wilson, B.S. et al. (1986) Chromogranin from normal human adrenal glands: purification by monoclonal antibody affinity chromatography and partial N-terminal amino acid sequence. Regul Pept. 13 (3-4): 207-23. Galfré, G. et al. (1977) Antibodies to major histocompatibility antigens produced by hybrid cell lines. Pernicová, Z. et al. (2011) Androgen depletion induces senescence in prostate cancer cells through down-regulation of Skp2. Endo, C. et al. (2009) Immunocytochemical evaluation of large cell neuroendocrine carcinoma of the lung. Nam, K.T. et al. (2012) Gastric tumor development in Smad3-deficient mice initiates from forestomach/glandular transition zone along the lesser curvature. Lab Invest. 92 (6): 883-95. O'Neal, R.L. et al. (2013) Human epididymis protein 4 is up-regulated in gastric and pancreatic adenocarcinomas. Hum Pathol. 44 (5): 734-42.